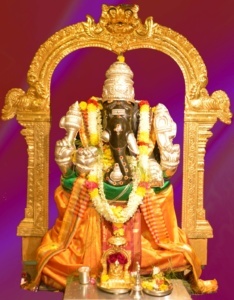 Blessings from Sri Maha Vallabha Ganapati Devasthanam on this auspicious Sankata Hara Chaturthi which is observed every month on the 4th day after full moon..
Every Sankata Hara Chaturthi Day – Maha Ganapati Abhishekam is performed at 7:15 p.m. followed by Gakara Archana, Upacharam, Prakara Utsavam, and Harati. 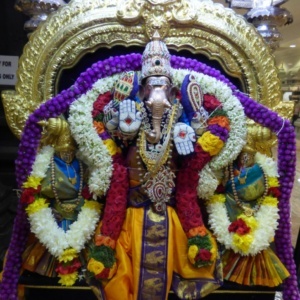 Please come to the Temple with your family and your friends for a divine darshan and blessings of Sri Maha Vallabha Ganapati. Please sponsor Sankata Hara Chaturthi poojas and receive the blessings of Sri Maha Vallabha Ganapati. See below for sponsoring information. Om! Salutations to You, the inspiring and delightful Lord Heramba (Ganapati)! Kindly destroy all my hardships.